Kerry Gaa Tv was back in the Austin Stack Park this week for the show. Christy and Sonny had a review of the Garvey's Senior Hurling semi finals. Lixnaw and Ballyduff will contest the final. Gerard McCarthy was on hand to make the U21 Championship draw. The County Championship Quarter Finals were played on Saturday and Sunday. Tim Moyinhan was there to make the draw for the semi finals. On Thursday Night Tomás O hAiniféin, Tom Keane (Chairman) and Jimmy Darcy (PRO) gave us the background to Coiste na nÓg in the county. They also had a look towards the County Championship Finals at U16, Minor and Senior. In the club scene we had a special request from SPA GAA Club. 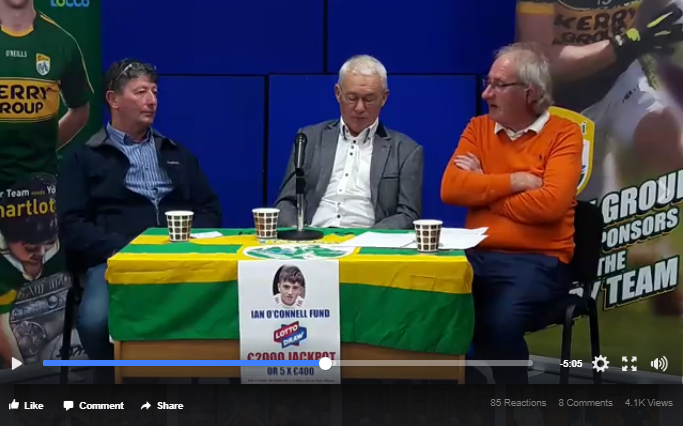 They are doing a fundraiser for the "Ian O'Connell Fund". We trust you will consider this worthy cause when called upon. Special Lotto tickets €5 on sale/collection for juvenile Ian O Connell Fundraiser in Torc Hotel tonight Thurs Sept 28th @8.30pm. Your support is greatly appreciated and thanks to everyone who has volunteered their services already for this worthy cause. All proceeds go towards Ian O Connell fund.